AquaMobile Swim School offers private swimming lessons for babies, toddlers, and preschoolers to learn how to swim and develop their confidence in the water. In addition to the AquaMobile Learn-to-Swim program, we also provide private swim instruction of the Red Cross and Lifesaving Society swim programs. All of our private swimming lessons for babies, toddler, & preschoolers are taught by AquaMobile certified and insured swim instructors in the comfort of your own pool. Private swim lessons allow for a customized lesson plan that is catered to your infant or preschooler’s individual needs. For first time participants, your AquaMobile private swim instructor will conduct an assessment during the first lesson. Each student receives a report card and an award to commemorate the completion of each level. At AquaMobile Swim School, we’ve designed a learn-to-swim program for private swim lessons for ages 3 months to 5 years of age. Below is information about our private baby swimming lessons, private swimming lessons for toddlers, and private preschool swimming lessons, followed by a list of swim skills learned in each level. Below is a partial list of skills taught in each AquaMobile swim level. With AquaMobile Swim School, your baby can start their infant swim lessons as early as 3 months old. Baby swimming lessons taught via AquaMobile’s at home private swim lessons are a great way for your child to get accustomed to the water in a safe and comfortable environment. AquaMobile’s private baby swimming lessons provide you with a fun and secure way to help your baby learn to swim. 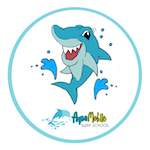 AquaMobile private swimming lessons for toddlers and their parents are geared for students ages 3 months to 3 years old. In levels Seal & Pup 1 and Seal & Pup 2, parents and child are in the water together. These toddler swimming lessons provide water orientation and safety activities in a fun learning environment for both parents and their tots. Parent & Tot private swim lessons incorporate songs and games to engage and interact with your toddler in the water. AquaMobile’s private preschool swimming lessons allow young children to further develop their swimming skills one-on-one with their AquaMobile private swim instructor. The Seahorse, Clownfish, Dolphin and Shark levels are geared towards preschool swimming lessons for children ages 18 months to 5 years and gradually introduce learn-to-swim and water safety skills in an age-appropriate learning environment. AquaMobile provides the Red Cross swim programs through private swim lessons in your own home pool, facilitating a better learning environment for your child to learn to swim. The Red Cross preschool swimming lesson program is designed for children ages 6 months to 5 years of age. The first two baby swimming lessons levels, Starfish and Duck, aim to provide water orientation and safety for parents and their infants. The next five levels, Sea Turtle, Salamander, Sunfish, Crocodile and Whale, progressively build swimming skills and age-related safety for toddler swimming lessons. The upper Red Cross preschool swimming lessons levels are aimed at the advanced toddler who is too young for Red Cross Swim Kids, but has developed swim skills beyond most toddler swimming lessons. The Lifesaving Society’s official Swim for Life program is available via AquaMobile’s at home private swim lessons. The Lifesaving Society’s baby swimming lessons and toddler swimming lessons are designed for children ages 3 months to 5 years of age. The first three levels are parent and tot classes for ages 3 months to 3 years, which stress the importance of play in developing water-positive attitudes and skills. The next five levels ensure that 3 to 5 year olds become comfortable in the water and have fun developing a foundation of water skills.